Call Now and Experience The Freedom Model Difference. The Freedom Model Addiction Program is designed to teach you the immense power you have to direct the course of your life. Our Program has worked for thousands of people and can work for you as well. The Freedom Model is a Non-12 Step Program designed to motivate you to achieve Permanent Sobriety. Freedom is knowing you can choose any path and that you are not trapped in a lifelong pattern of addiction. Through education, you will learn how to change the patterns associated with addiction. Positive change is possible by seeing addiction as a choice. You will learn how you can make positive changes in your life by gaining insights into your beliefs and your reactions to challenging situations. With 30 years of research and experience, The Freedom Model Retreats have helped thousands of people take back control of their lives. Are you are ready to take control of your life? If the answer is yes, call today and learn more about our life saving addiction program. We Are Here to Help! The Freedom Model Retreat's success rate is something you won't find at any alcoholism treatment or drug treatment program today because our success rate is independently verified by a third party research organization. Treatment providers across the country that claim success rates have no documented research to back up their claims. Our Success Rate is Verified and Measured by Outside Research Organizations. Based on Abstinence From All Substances. Also Corroborated By Family Members. 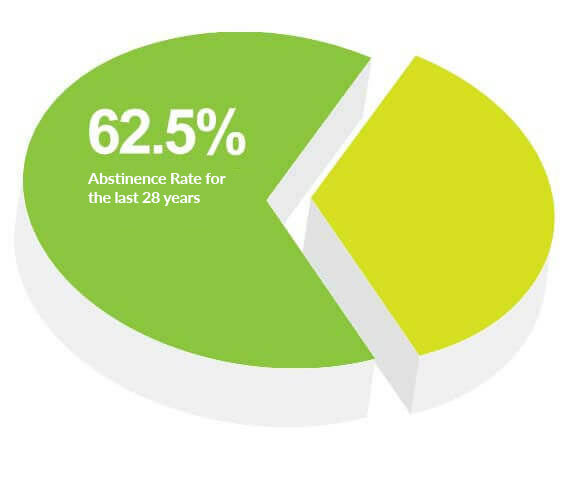 Our 62.5% long term success rate is a far more accurate number than drug rehabs or drug treatment facilities because treatment centers who claim success rates survey their clients only a week after program completion, or only while the individual is enrolled in the facility. Our survey results reflect their success a minimum of 1 year after completion and the analysis continues in perpetuity and has for the past 28 years. We encourage you to ask treatment providers you are considering about their success rates, and if they claim a success rate to produce the documentation to back it up. Many will tell you they don't do actual outcome studies for a variety of reasons, and some will give you an estimate of their success rate based on their personal feelings of what it might be. While other treatment providers will openly mock the idea of a success rate to cover up their lack of confidence in their program outcomes. Unlike treatment, The Freedom Model is completely transparent and we will give you copies of the independent studies up front - it's our commitment to you. View our Success Rates Now. At The Freedom Model addiction is a habitual behavior that is the result of your beliefs, habits and choices. At the retreats you will understand the three pillars of The Freedom Model: The Positive Drive Principle, Free Will, and Autonomy. These are the three core tools that free an "addict" or an "alcoholic" from those destructive labels and move past addiction forever. In Treatment -- Addiction is a chronic, progressive, incurable brain disease that renders you powerless over substances, behaviors, thoughts and urges. You never overcome it but remain in perpetual treatment and endless recovery. The Freedom Model upends this terribly limiting and unnecessary struggle. Retreats you are never diagnosed or labeled as an addict or alcoholic. The Freedom Model completely deconstructs ideas like powerlessness and hopelessness that define addiction. Guests work through the text and workbooks to transform their beliefs surrounding addiction so they can move past it permanently. In Treatment - Your future is forever defined by your troubled past. You never leave behind your addiction and mental health diagnoses. The methodology in treatment is nearly all 12-step based and disease centered and requires endless recovery. You are never free and center your life on your "disease" and "recovery". At The Freedom Model success is defined as gaining a renewed sense of control over your choices, behaviors and your life. It is true freedom from addiction. There are no meetings to attend, no fear of "triggers" or "relapse", just freedom to choose what you see as best for your life and the freedom to move past addiction forever. In Treatment - You sit in talk therapy and support group meetings to learn to take life "one day at a time" and avoid triggers such as stress, trauma, people, places, and things - integral parts of life that can't be avoided. This sets up perpetual failure and a need to "be treated" for the rest of your life. "The staff here was amazing at every level, they helped me realize my full potential." "I gained the tools I needed, as well as making life long support, and friends. The Freedom Model really allowed me to come out of my shell. I will carry these skills for the rest of my life." "My past doesn't define who I am or who I will become. My future is all in my hands. I will go on to do great things now that I have this knowledge." "The Freedom Model has truly saved my life. I'm beyond grateful for the program here, it truly works if it something you really want. The staff here are unbelievably amazing and helpful. I would refer this place to anyone in need of help." "I came here a broken individual, unsure of myself, unaware of my own skills and accomplishments, and am leaving here as a confident man ready to take life head on." "I highly recommend The Freedom Model as a true non 12-Step program that provides knowledge, tools, and examples of how to resume living a positive, full life." Prior to making your decision, you can speak with past guests and their families and hear from people just like you how their lives changed and how yours can too. 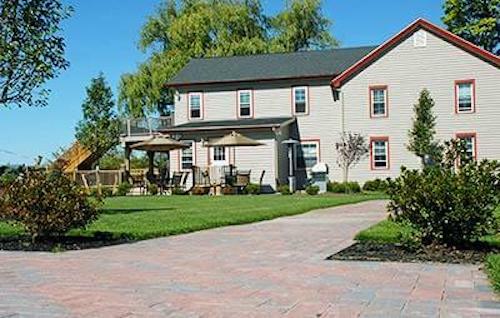 We always welcome you and your family to tour our retreats, talk with our staff and current guests, access The Freedom Model for free, and experience how The Freedom Model can help you to free yourself from addiction and the shackles of perpetual recovery. So you can truly feel confident that The Freedom Model is the best decision for you, we offer a 1-week trial. Call Now to Learn More. The Treatment Doesn't Work Abstract provides research regarding the statistics of alcohol treatment centers and drug rehabilitation programs that use medical and psychological methods such as: drug treatment, clinical therapy, certified therapeutic counseling strategies, licensed chemical dependency counselors, drug addiction and substance abuse counselors, psychiatrists, insurance based drug rehabs, hospital based drug abuse counseling and alcohol abuse counseling, in-patient rehabilitation programs, out-patient rehabilitation programs, therapeutic communities, 12 Step support groups, AA, Alcoholics Anonymous, Narcotics Anonymous, NA, 12 Step meetings, and halfway houses. For the purpose of this website, Drug Rehab and Alcohol Rehab, Rehabilitation, Treatment, Residential Treatment, Detox, and Detoxification refer to treatment programs that use medical and clinical methods to treat alcohol abuse and drug problems. The references to Alcoholics Anonymous Meetings, AA Meetings, Narcotics Anonymous Meetings, NA, and 12 Step Meetings refer to national support groups that adhere to the disease concept of alcoholism and drug addiction following 12 Step disease based principles.